Equipment is selected for the complete process line and all the equipment are manufactured on technical know-how from Sweden as per their design, standards, and technology. All process equipment are fabricated in stainless steel, except for the standard parts such as the motors, gearboxes and such components. All electrical components, motors, modular plastic belts, pumps etc. are of international brands. Freshwater is added by spray nozzles and the water level of the washer can be adjusted. Abrassive Peeler x 2 Nos. Special profile rollers for complete rotation of product. Easy inspection and trimming of potatoes on the conveyor. Hopper for receiving peeled potatoes. Constant and regulated feed of potatoes as per rated capacity. Stainless steel fabrication, with food grade plastic belt. For buffer storage of peeled potatoes. Volume – 1.3 m3 approx. For slicing of potatoes in the desired thickness. Elevator for receiving potato slices and feeding to the blancher. Pneumatic steam regulation valves for control of blanching temperature. Water circulation for even blanching. About 1650 kg. of Potatoes in Blancher at a time. Steam consumption 200 kg./hr. per Ton of Potatoes. Receives material from the blancher. A screw type water cooler for cooling the slices. Constructions are similar to blancher with a water circulation pump. Receives material from the Cooler. A pump with stainless steel tank for transporting slices by water circulation up to the inlet of de-watering chute for feeding the steam cooker. 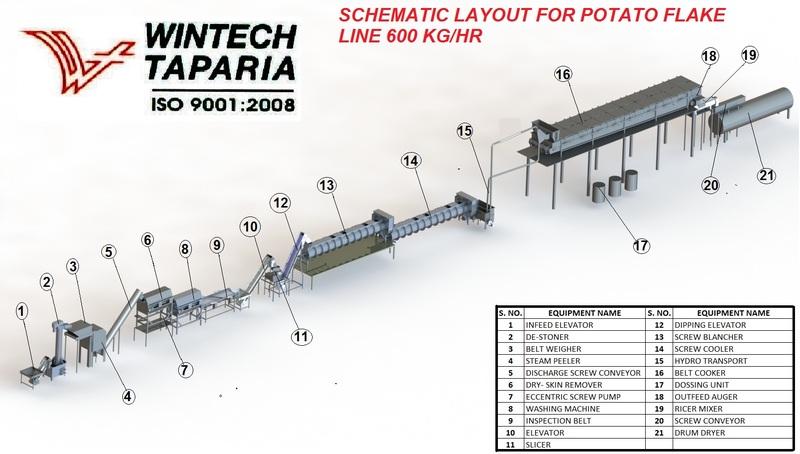 The potato slices are cooked in steam and are conveyed on a variable speed driven belt conveyor. Cooker is provided with several lids for easy inspection and cleaning. Variable speed drive for blanching cooking time is adjustable. Stainless steel construction except for standard parts. 3 Nos. of stainless steel tanks. 3 Nos. of dosing pumps. Built on common frame, stainless construction. Receives material from the cooker. Placed at outfeed end of cooker. Receives material from the outfeed auger. Complete stainless steel construction. Connection for additives from the dozing system. Receives material from the ricer and conveys to Dryer. PLC control panel siemens PLC Panel will have a 15 inch HMI and necessary safety features, advanced process control panel. Panel is completely assembled and pre-wired. Switch Gears and other components of international brands, preferably Siemens. Visual fault diagnosis with Popup on HMI Alarm Hooter. PID controller for precise Temp. Control. Temperature monitoring in required equipments. Variable Frequency Drives- Electronic Speed Control. Electrical Components of International Standards. Panel cabling with easy traceable codes. One Set of As Built drawings for panel. This until is capable of producing 600Kg/hr. of Potato Flakes per hour based on 21% feed solids. Drum size 5’ diameter and 17’ long cast iron designed for 125 psig steam pressure, and is constructed in accordance with the latest ASME code for unfired pressure vessels and National board stamped. The dryer is fitted with five (5) spreader rolls, oscillating knife holds, pneumatic knife adjustment, ribbon types feed screw, vapor duct with blower and variable speed drive.